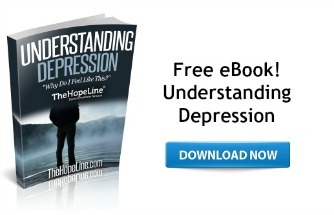 Understanding God’s Hope and Help for Depression. Struggling with depression and lost hope? You are not alone. Bible verses of hope to help you cope and understand depression and God’s love for you. Psalm 69: 1-3 Save me, O God, for the waters have come up to my neck. I sink in the miry depths, where there is no foothold. I have come into the deep waters; the floods engulf me. I am worn out calling for help; my throat is parched. My eyes fail, looking for my God. Psalm 69:16-18 Answer me, Lord, out of the goodness of your love; in your great mercy turn to me. Do not hide your face from your servant; answer me quickly, for I am in trouble. Come near and rescue me. Psalm 30:5b Weeping may endure for a night, but joy comes in the morning.